They say it is the most important meal of the day, and while waking up early to get it may not be everyone’s favorite thing to do, breakfast is the best motivator for getting up and out of bed. From savory omelettes to decadent stuffed french toast, this list has all of the places to get the best breakfast in New Hampshire’s Monadnock region. The Monadnock region is home to many amazing restaurants responsible for serving up the best breakfast in New Hampshire. Some of the restaurants on this list have been around for many years and are local institutions, but they are all eligible for a place on this best breakfast in New Hampshire list. 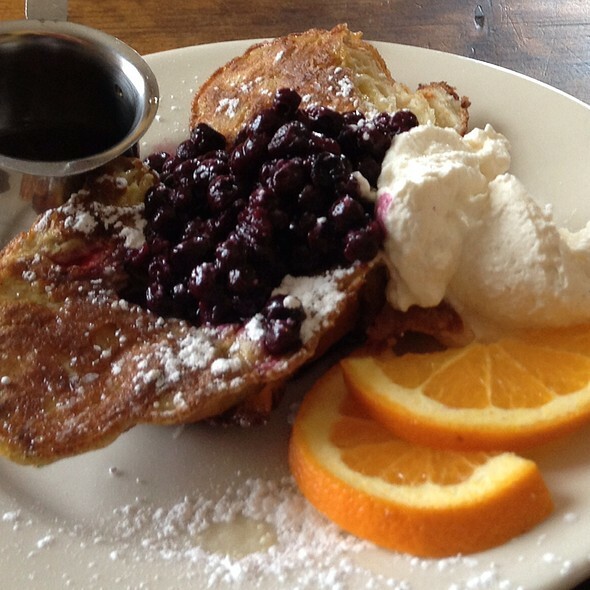 The following are the six of the best breakfast restaurants in the Monadnock Region. Nestled in a strip mall in New Ipswich, New Hampshire Nennie’s Five Star Café is a diamond in the rough. The convenient location right off of NH route 123 makes this restaurant an amazing place to stop off, refuel, and get the star treatment. Coffee is delivered to the tables in a mug with a large star on it because all of the Nennie’s patrons are treated like stars while dining at this restaurant. Their menu has all of the breakfast classics required of a traditional American breakfast joint that won’t break the bank. Nennie’s is an overall great breakfast experience and the first on the best breakfast in New Hampshire list. 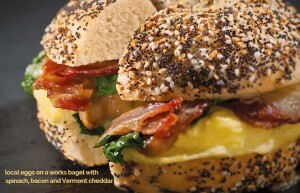 The Works Bakery Cafe is a bakery in Keene, New Hampshire that serves breakfast all day. This healthy option believes in sustainable produce bought from local supplies. Their small town feel and welcoming attitude have caused others to take notice and the multiple Works Bakery Cafe’s stretching from Maine to Vermont have won numerous awards, including Best of Business for their Coffee, Monadnock Green Business of the year, and Best of New Hampshire for their bagels. The picture to the left of their local eggs on an everything bagel with spinach, bacon and Vermont cheddar seems to sum up exactly why you want to pop in. Their delicious food made, as they say, “with love.” Make sure you don’t miss this Monadnock region best breakfast in New Hampshire restaurant. For a down home country feel complete with a wood burning stove, look no further than The Bagel Mill in Peterborough, N.H. The next up on this best breakfast in New Hampshire list is a little off the beaten path, but absolutely worth the extra effort. The Bagel Mill churns out dozens of fresh, real kosher bagels everyday and boasts a wide variety of both savory and sweet bagels and spreads. For those with a sweet tooth, a cinnamon bagel complete with a cinnamon sugar crust is a must have experience. Their spinach and garlic bagel is the best savory choice when paired with either garlic & herb or bacon & scallion cream cheese. The Bagel Mill also make a variety of bagel sandwiches though many have given testimonials that even a plain bagel with cream cheese is worth the drive. 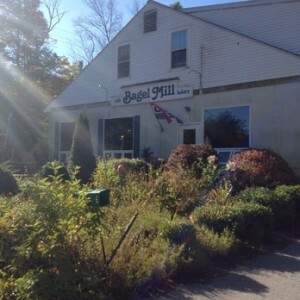 Homemade bagels, great coffee, and free wifi qualify The Bagel Mill as a best breakfast in New Hampshire spot. 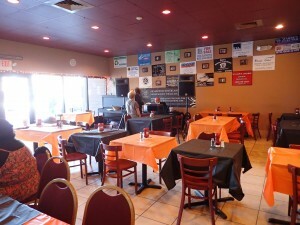 The Hilltop Café is a down to earth gem located in Wilton, N.H. The greatest, socially responsible aspect to the Hilltop Café is their ongoing partnership with Temple Wilton Community Farm, one of the oldest CSA’s in New England and the nation. The Hilltop takes pride in their partnership with the CSA and providing patrons with locally sourced meals and a true farm to table experience. The Hilltop Café has a wide variety of funky breakfast fair for the more adventurous eaters such as huevos rancheros, israeli eggs, and even a breakfast soup! Another big draw for the Hilltop Café is their home-made croissants that come in a variety of different flavors. The Hilltop even makes their legendary french toast from the home-made croissants. In addition to their food, they also have an impressive drink menu. Their maple latte has cultivated a significant following, and they also have seasonal beverages that are extremely popular. The experience provided by the staff at the Hilltop Café and their dedication to making delicious locally sourced food make them an obvious candidate for best breakfast in New Hampshire and the Monadnock region. The Riverhouse Cafe in Milford, New Hampshire is a must have on any best breakfast list in New Hampshire list. 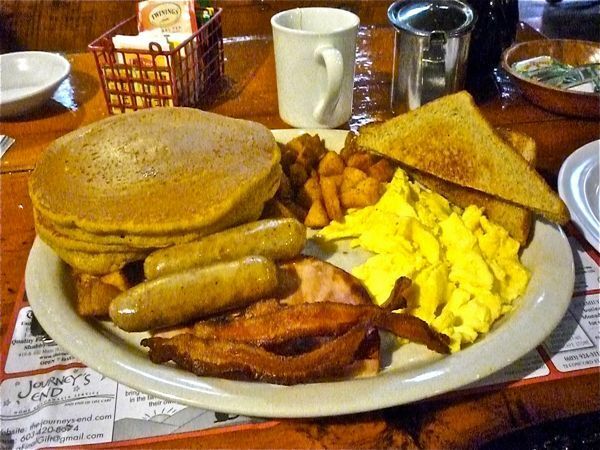 This Monadnock region staple has one of the most extensive breakfast menus in the state. The menu includes a number of delicious signature creations aptly named things such as “compost heap”, “smoke stack”, and “garden patch”. 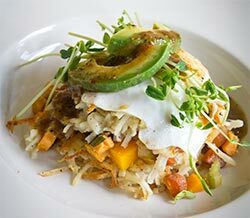 The “compost heap” which was featured in NH Magazine has “roasted veggies, Monterey jack cheese and sliced tomato between two cheesy hash browns, topped off with two eggs your way, organic pea shoots, avocado and salsa verde” all for under $10! In addition, they also have many signature breakfast sandwiches, eggs benedict, and biscuits and gravy with home-made buttermilk biscuits. Each item on the menu at the Riverhouse was delicately crafted and is sure to please. There is no breakfast restaurant in New Hampshire with as ample of a menu as The Riverhouse Cafe, which places it on this best breakfast in New Hampshire list. Oh, and did I forget to mention that they have a brunch burger? 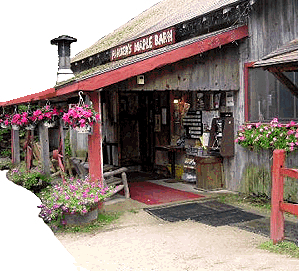 Parker’s Maple Barn in Mason New Hampshire is hands down the best breakfast in New Hampshire, the Monadnock region, and probably all of New England. They are a fully functioning maple sugar mill which is open for tours during the sugar season. Parker’s is a local legend so unless you are prepared to wake up and be there for opening, be prepared to wait for a table. Not to worry though, if you happen to catch Parker’s in a busy moment, there is always the corn crib gift shop. The shop boasts maple flavored products from maple candy to the maple coffee they serve in the restaurant, even maple jelly beans which are surprisingly delicious (and addicting). Though the reason people go to Parker’s Maple Barn is for the food which is no lie, out of this world amazing. Parker’s has the biggest, fluffiest pancakes around including flavors such as buttermilk, blueberry, buckwheat, pumpkin, and seasonal pancakes. 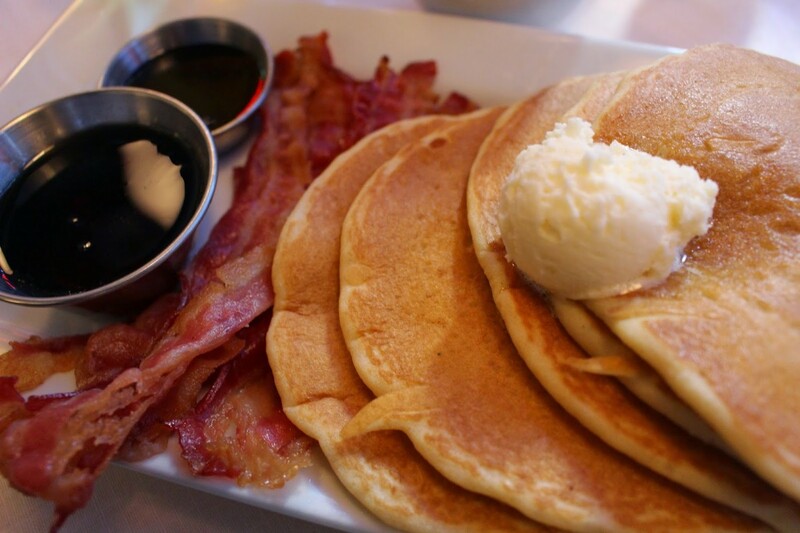 Their most popular menu item is the Parker’s Maple Barn Special: two pancakes, two eggs, bacon, ham and sausage or all ham hash, homefries and thick homemade toast served with their Pure Maple Syrup. When the Parker’s special is brought to your table, the portion is so large that it is truly a feat to finish it and remain standing. Also, Parker’s has maple sugar EVERYTHING from baked beans to coffee, and everything in between. My personal favorite menu item at Parkers? The homemade corn beef hash. My usual order is the corn beef hash omelette with a choice of cheese that is so good it is unreal. However, if I chose to order something different, I always make sure to order a side of corn beef hash. Without a doubt, Parker’s Maple Barn is the best breakfast in New Hampshire.